Set of 12 cute Rubber Ducks dressed up as Pilgrims and Indians add to the Thanksgiving Holiday fun. Thanksgiving is just around the corner. You will have kids at the house for the holiday. Obviously you “need” some Rubber Duckies to help celebrate this holiday. Ok, so maybe “need” is a bit of a strong word. But these little duckies are really cute and can make a great table decoration for kids this Thanksgiving. 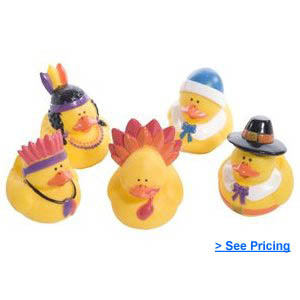 The set comes with 12 small rubber duckies dressed up as Pilgrims and Indians.